Like most teachers, as soon as pupils are sequestered in the exam hall I always used to race around trying to get my hands on the exam paper and anticipate how my eager charges will have coped. A few years ago I remember picking up the foundation tier GCSE English Literature paper and seeing a real gift of a question on the theme of dreams in Of Mice and Men. When they came streaming out I excitedly asked them if they’d done it but none of them had. Why? Because it contained the word futility, and they had no idea of its meaning. A poor vocabulary is a huge barrier to academic success. In order comprehend a text we need to know an estimated 95% of its vocabulary. This might sound surprisingly high but think about the last novel you read – how many unfamiliar words did you encounter? One or two at most? Certainly few enough that your understanding and enjoyment were not impeded. 5 percent of words might be about 10 per page – at that kind of frequency our ability to comprehend disintegrates rapidly. Conversely, the more words you know the easier you’ll find it to guess the meaning of unfamiliar words. If you know 95 percent of the words not only will you understand the text but you have a good chance of learning the other 5 percent. If you know fewer the 90 percent, then you’re probably stuffed. This leads inexorably to the Matthew Effect: the greater your vocabulary the easier you’ll find it to read and the more vocabulary you’ll acquire. After the age of 5, we acquire most new vocabulary through reading. But if we don’t read, we don’t acquire it. Obviously the best way to build vocabulary is to read, but apparently we only learn about 15% of the vocabulary we encounter in written texts so we need to read a lot to make sure we encounter words on multiple occasions before they’ll become pert of our working vocabularies. According to one source, if you read for twenty minutes a day you’ll encounter an estimated 1,800,000 words over the course of a year whereas reading for only one minute a day will result in only 8,000 words. Now I’m not sure of the source or of the maths but if it’s only slightly true then this suggests something important. Is twenty minutes a day doable? Is this something schools can effectively mandate? I have no idea how feasible it might be to get all children reading for twenty minutes a day, but it certainly seems a worthy and relatively achievable goal. And while we’re trying, it might also be worth putting a vocabulary building programme in place. Many schools have a word of the week or word of the day in operation, but how do they choose what words to focus on? We don’t need to worry about tier 1 – pupils usually arrive knowing the basics and if not they will quickly pick them up in conversation with their peers. And we’re pretty good at recognising pupils won’t know Tier 3 words – these are our subject-specific key words. But Tier 2 vocabulary presents a problem – because we read these will be words that are so familiar to us that we don’t notice pupils won’t know them. But these are usually words that pupils will already have a conceptual understand of, even though they’re unfamiliar with the vocabulary. This makes Tier 2 words relatively straightforward to teach: all we have to do is provide a synonym. If you explain that benevolent means kind, few children will struggle to understand kindness as a concept. In her fantastically useful book Bringing Words to Life, Isabelle Beck suggests there are 7,000 word families which are very high frequency in written texts and very low-frequency in speech. These are words that feature heavily in textbooks and exam papers. They are part of the language of academic success; if you’re familiar with the likelihood that you will be academically successful is so much greater. Obviously as a classroom teacher, you can’t teach all this as you wouldn’t have time to do much else, but giving pupils access to challenging texts will expose them to much more Tier 2 vocabulary than they will encounter in dumbed down, ‘student friendly’ texts. But just giving pupils challenging texts isn’t enough. 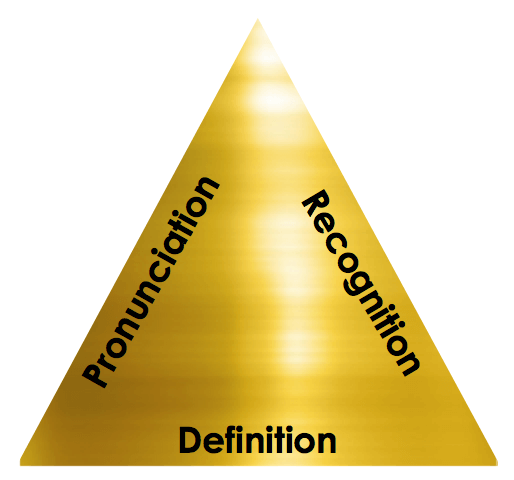 If we want to make sure pupils learn this vocabulary we should concentrate on the ‘golden triangle’ of recognition, pronunciation and definition. Recognition – how is the word spelt? The ability to use phonics to decode new vocabulary and then to be able to reproduce the spelling makes a dig difference. Pronunciation – how is the word said? Making pupils say it aloud and use it in a sentence increases the likelihood they’ll remember it. Definition – what does the word mean? It might sound obvious, but if you know the meaning of a word, you’re much more likely to remember it. If we were to design a vocabulary building programme that concentrated on the words with the most instructional potential and highest utility then we might make a real start in closing the language gap between word-rich and word-poor children. And because we’re focussing on building vocabulary, it makes sense to teach pupils prefixes, suffixes and roots to help them puzzle out the meaning of new vocabulary more easily. If you know bene means good or well, you have a chance of working out beneficial, benefit, benevolent etc. Would it be possible for schools to use tutor time to introduce powerful Tier 2 vocabulary, focussing on the pronunciation, recognition and definition of words and then ask staff to encourage and reward pupils for using the word of the day in lessons? It strikes me this might be a lot more useful than a lot of what goes on in the name of literacy and would require little in the way of preparation and execution. Colleagues teaching EAL learners (both new to English and developing academic fluency) will also find Norah McWilliam : What’s in A Word invaluable. Kamil Trzebiatowski reviews here http://valuediversity-teacher.co.uk/what-a-wonderful-book-whats-in-a-word. The importance of introducing vocabulary within grammatical structures and collocations is emphasised, as is the impact of rehearsing the use of academic vocabulary in an appropriate context. As always there’s something else to read! Have you read Beck? I wholeheartedly agree. I so admire the TED talks where people young and old can get across often complex messages using the power of plain English. Complex written language is wonderful to shape and collect ideas but to communicate with effectiveness is to have the power to influence and promote. Children who do not have the vocabulary to explain their ideas or the confidence with the language to debate are very quickly side-lined. Reading and using language usage go hand in hand therefore we should teach vocabulary as a gift. I was taught at 10 by a wonderful woman who read the whole of Watership Down to us – if the children will not read then let them listen. 2) Snowball Fight: write a sentence containing a new words, screw up your paper and throw it to the front. Get a new snowball, reply to or extend the previous statement using another new word etc until all words are used (3-4 rounds suffice!) – followed by peer assessment on correct usage and any improvements. 3) Vocab Quiz: using a long paragraphed text with new vocabulary: students compete in groups to write down the word the teacher is explaining/paraphrasing etc – give clues as to which paragraph the word is in. Collect new words at the end and challenge class to put as many as possible into a sentence. 4) Game of Thrones: put students in 4/5 groups and draw as many castles on the board (3 thrones or towers for each castle). Students then challenge another group with a new word and they have to create a sentence within 5 seconds. If successful they can destroy anybody else’s throne – if not, they lose one etc. Once you’ve lost all three thrones (=lives) you’re out! I still use Five-Minute Activities, which contains a range of vocabulary activities for EAL and L1 students. It’s by Penny Ur and Andrew Wright and is published by the CUP (1992). The point made about the word ‘futility’ in the exam question is so common. My nephew and pals sat their A Level Literature exam only to become baffled from the start because there was a word in the question that they didn’t understand. I am so annoyed that dictionaries can’t be used in exams because calculators are permitted in certain maths exams and ‘in real life’ one will always reach for a dictionary if they can’t comprehend a certain word. It seems ridiculous to me! I feel your pain but don’t think outsourcing our vocabulary to dictionaries is the answer – we can only think with the words we know – it therefore seems a better solution to explicitly teach academic vocabulary and expose children to challenging texts. I understand what you say. Reading ‘Woman in Black’ was painful with a group of year 8s as there were over 50 words in chapter one alone that the class didn’t understand or could even put into context so majority switched off! In training events, I recommend that every pupil has a word book which is used to note any words which are difficult to decode and any words which are not known in terms of meaning. Teachers then need to allow time to address this bank of new words – sharing them with other pupils as appropriate, and looking up the range of meanings of new words as appropriate. The concept behind the Readers Digest Word Power is also a great resource. I think there are a few quiz apps out there for this these days. I use to LOVE ‘enrich your word power’! Can you let me know of any good vocab apps? Hello David. We have built an app that teaches the very words outlined by Beck and in this blog post. The site goes above and beyond the triangle above to ensure that children absolutely know what core academic vocabulary means. New vocabulary blocks are being developed on a continual basis and we are inviting schools to use the site for free. Please do pass on the details to anybody who is serious about closing the gap between word-rich and word-poor pupils as that’s our entire raison d’etre! Hi Aaron – that sounds great – what’s the name of the app? We are continually gathering positive progress data so we would be pleased to share these benefits with any schools who are interested in using technology to intervene in word-poor contexts. Great blog by the way! No problem at all. If you email me via aaronleary@bedrocklearning.org I can get you an account created for you to use the site. An excellent read. I’m with you all the way on this. Having recently carried out reading tests (word recognition + reading comprehension) with over 100 Primary students, there is a clear correlation between vocabulary/prior knowledge and levels of comprehension. I have come across many students with excellent decoding skills, who hit a (metaphorical) brick wall once faced with unfamiliar vocabulary/content. In the US there are many commercially available vocabulary teaching resources. Vocabulary is TAUGHT. This may have something to do with the SATS (University entrance tests) where a rich vocabulary is essential if one wants to achieve high scores. Working with bilingual/multilingual students, having a second language with a Latin base, is a big advantage. My students can often use their knowledge of French or Italian to decipher unfamiliar words in English. I loved this great food for thought. Thanks for the very useful post. I’m also a big fan of Bringing Words to Life. I imagine you’ve probably already read it already (given the reference in your posting to Matthew Effects) but, if you haven’t, Chapter 13 ‘Measuring Print Exposure: Attempts to Empirically Track “Rich Get Richer” Effects’ by Keith Stanovich in Progress in Understanding Reading, (2000, Guildford Press, London) is a read I’m sure you will enjoy. Thank you – I really enjoyed reading this and all the comments too! Something that I love about printed language is that the fine grained and very subtle distinctions between words are intuitively understood by the young reader – if the passage is not too difficult and has been crafted with care. Usually, the meaning of an unfamiliar word will be integrated contextually, providing the learner with an accurate and insightful illustration of how best to understand that particular word. Let’s not underestimate this natural process of language learning. To help less confident readers to feel more comfortable around unfamiliar words, my favourite approaches to vocabulary enrichment are etymology and near synonyms. Both of these work brilliantly with dyslexic learners. Etymology fascinates because the roots of our language not only connect us to a world of myths and legends of ancient Saxons, Norse, Greeks etc, but also provide rich and powerful explanations for spellings of words such as ‘psyche’, ‘phoenix ‘ etc. Near synonyms are good fuel for group discussion. For example, there are dozens of near synonyms of ‘clever’ and learners enjoy finding the one that best describes them and their particular skills and in the process discover that language is actually rather interesting! 3. Awareness that words evoke colour and tone which influence the overall comprehension of the text.